AB SCIEX describes its new TripleTof 4600, unveiled today at the AOHUPO conference in Beijing, as a workhorse instrument which brings groundbreaking TripleTof technology to routine analysis. TripleTof (Tof meaning time-of-flight) is the company’s platform for simultaneous qualitative and quantitative analysis, promising high sensitivity and speed with high resolution and accurate mass to generate better information from mass spec analysis. LC/MS (liquid chromatography/mass spectrometry) technology is being adopted by more laboratories worldwide, the company says, as a way of coping with increasingly complex analysis requirements in drug discovery and disease research, as well as areas such as food contamination. 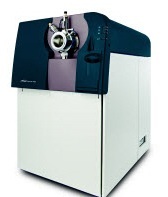 It says the TripleTof 4600 is aimed at the budget-conscious, offering ‘unparalleled’ value for applications including proteomics, screening for food contaminants, and analysis of drug metabolites in early ADME (absorption, distribution, metabolism, and excretion) studies. It complements the higher-end TripleTof 5600 system, launched in 2010. “TripleTof is the only platform with the speed and sensitivity to deliver comprehensive qualitative exploration, rapid profiling, and high-resolution quantitation, on a single platform,” said Dave Hicks, vice president of pharma and academic at AB Sciex. “The 4600 will appeal to scientists who thought they couldn’t get a TripleTof 5600. It combines the world’s fastest acquisition rates with intelligent acquisition strategies to maximise the benefits of UHPLC separations for high resolution accurate mass MS and MS/MS data”. The new instrument, he added, maintains the core capabilities of the TripleTof 5600, with no compromise in speed. “The TripleTof 4600 makes routine accurate mass quantitative and qualitative analysis available to virtually any laboratory”.